After much await, BlackBerry Messenger has finally arrived on Windows Phone albeit in beta form. Nokia/Microsoft announced back in February that the instant Messenger will arrive on Windows Phone soon and it has only arrived now. BBM Beta is available for Windows Phone users as an open beta, so basically all of you can go ahead and give it a try. The app boasts of a native Windows Phone experience and there are three swipeable pages upfront, namely feeds, contacts and chats. You can access the usual features through button down below and the three dots will take you deeper into settings and options. You can share pictures, voice messages, contacts and location on the app but Stickers, BBM Voice, BBM Channel features are missing. 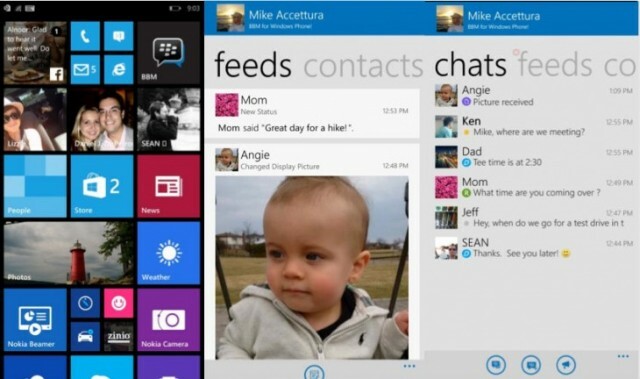 The BBM beta for Windows Phone also comes with some exclusive platform features like the ability to pin a contact to the Start Screen. BBM Beta is available for Windows Phone users to download but if you plan on waiting for a stable full release to the Store, you might have to wait “just a little longer”. If you want the BBM Beta for Windows Phone, hit the link below and get going.